Looking for the latest Stampin’ Up! products? Love making cards but need a cute idea and all the prep work done for you? Check out the kits below and choose the option that works best for you. The Sweet Stitches kit includes supplies to create 8 cards. The kit is available in 3 different formats, depending on whether you need tools and supplies in order to create your cards. BASIC/REFILL KIT: Includes 8 x card bases in Baked Brown Sugar, 8 x Whisper White mats, pre-punched trees, hearts and foam dimensionals for 8 cards and 8 x envelopes. Just $7.95 plus postage. *To complete, you’ll need a brown or red marker, white gel pen, Christmas sentiment stamp set, brown & red ink (or use your markers) and adhesive such as glue or double sided tape. MID KIT: Includes a basic kit, plus 1 x Real Red marker and 1 x Crumb Cake marker. Just $18.95 plus postage. 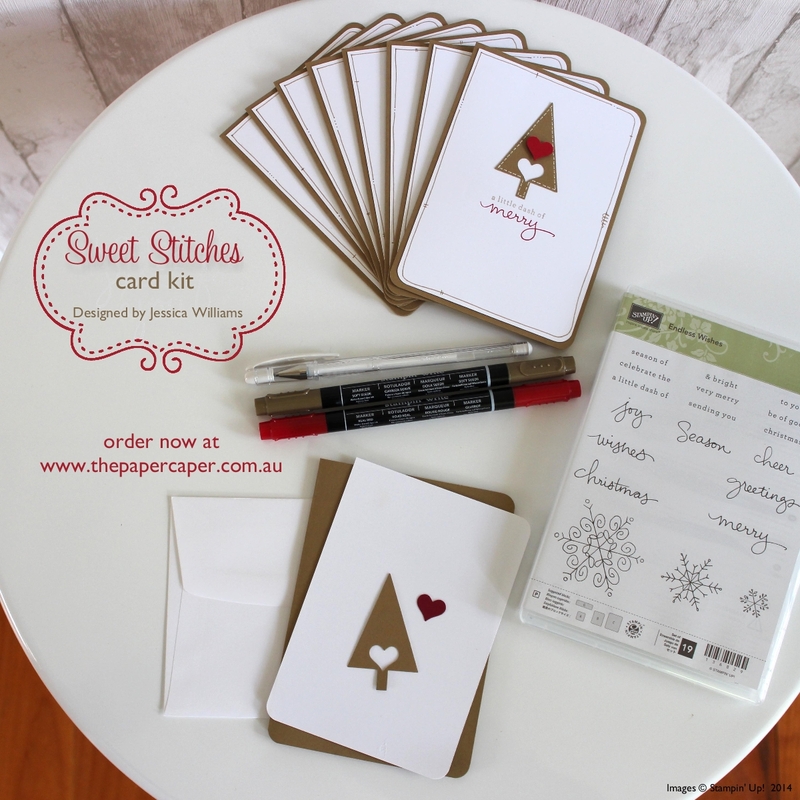 *To complete, you’ll need a white gel pen, adhesive and a Christmas sentiment stamp set. THE WHOLE KIT & CABOODLE: Includes a mid kit, plus White Gel Pen and Endless Wishes photopolymer stamp set. Just 49.95 plus postage. *To complete, you’ll need an acrylic block to mount your new photopolymer stamps and some adhesive. 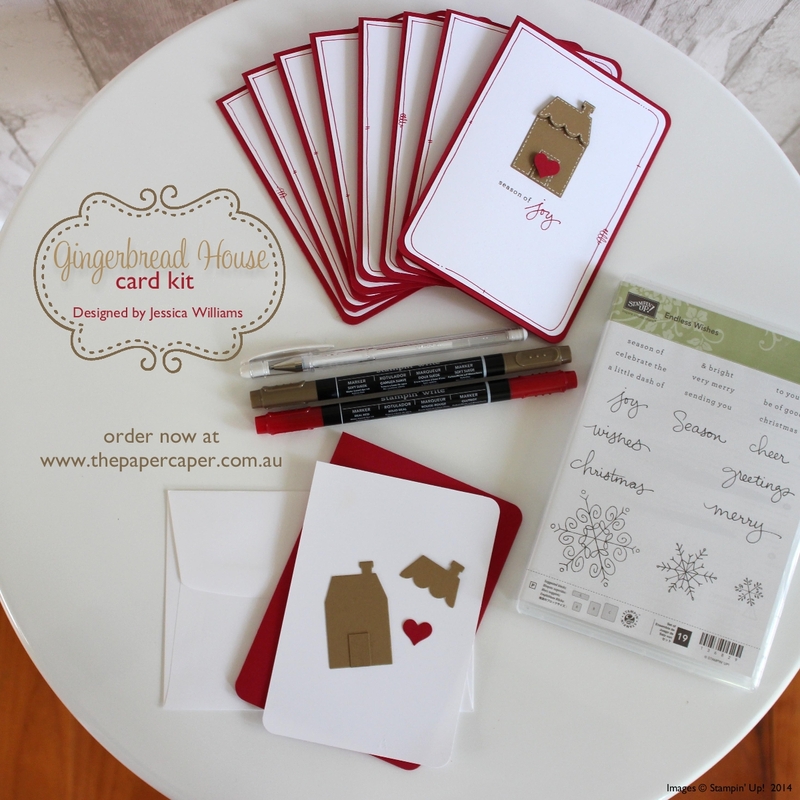 The Gingerbread House kit includes supplies to create 8 cards. The kit is available in 3 different formats, depending on whether you need tools and supplies in order to create your cards. BASIC/REFILL KIT: Includes 8 x card bases in Real Red, 8 x Whisper White mats, pre-punched houses, hearts and foam dimensionals for 8 cards and 8 x envelopes. Just $7.95 plus postage.